Today is my last day in the CPI Kenya office. The last day to pray that the internet connection lasts longer than ten minutes at a time, to use our building’s delightful squatty potty, and to enjoy a 2 pm lunchbreak at Sam Jan Cafe for $1.30. It’s the last day to work alongside the most inspirational group of coworkers I’ve ever known. 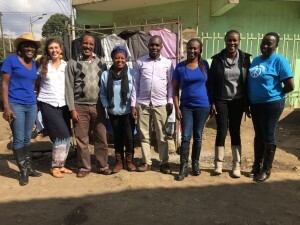 CPI Kenya’s small team became my family the day they picked me up from the airport. Through their hospitality, the CPI team has taught me so much about running a non-profit and community mobilization. Through their commitment to serving others, I have learned to listen and be more compassionate. My colleagues dedicate every day to bettering the lives of others through peace and friendship. In two weeks, I will leave Kenya a much better person because of their generosity, humility, and unconditional love. 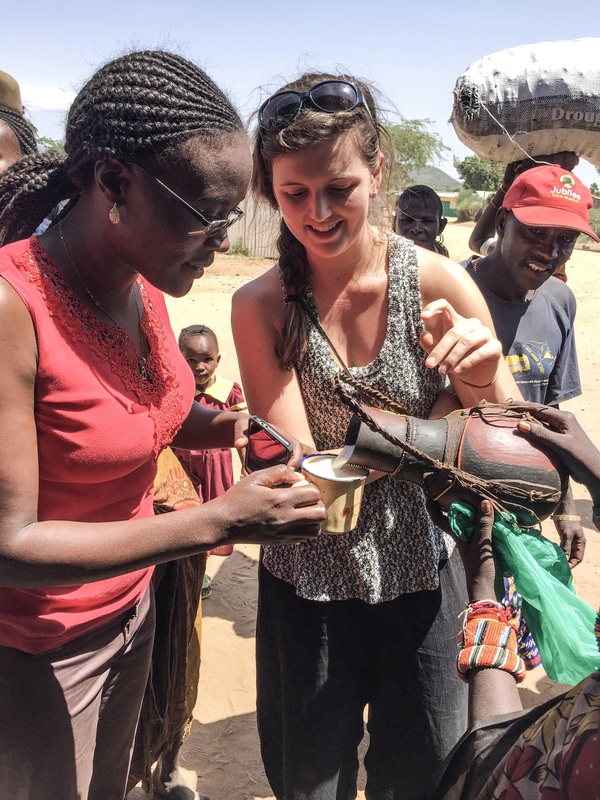 I will be eternally grateful for my experience as an AP fellow and the summer I spent with CPI Kenya making a visible difference in Samburu County. I love this country and these people, so I’d like to share a bit about five people I befriended through this organization. With Hilary on my first trip to the field. Hilary is our fearless captain. He is tall, charismatic, and probably should have been a preacher. He has a remarkable talent for making everything he says sound profound and worth remembering. The man could grandstand for hours on end without losing your attention because his genuine passion for community peace building is so palpable and captivating. If you’re ever in Nairobi, you should track down Hilary, take him out for a Guinness (his favorite drink), and enjoy one of his grand soliloquies. He holds a Master’s Degree in Peace Education from United Nations Mandated University for Peace (UPEACE) in Costa Rica and has over 15 years of experience in peace work. He worked for 8 years at the Catholic Diocese of Marsabit, Caritas Office as the Coordinator of Justice and Peace Office. In 2011, he began his own NGO after he met Jane and Monica Kinyua. He was struck by the fact that children are rarely involved or mentioned in conflict resolution and decided to commit himself to making children protagonists of peace. Hilary has an expansionary vision for CPI Kenya’s model. Over the next five years, he would like to continue spreading the program throughout counties in Kenya while also extending to Uganda and South Sudan. He feels that his model would benefit displaced communities and refugee populations facing inter-ethnic conflict. Exploring fields of tea leaves where Monica grew up! 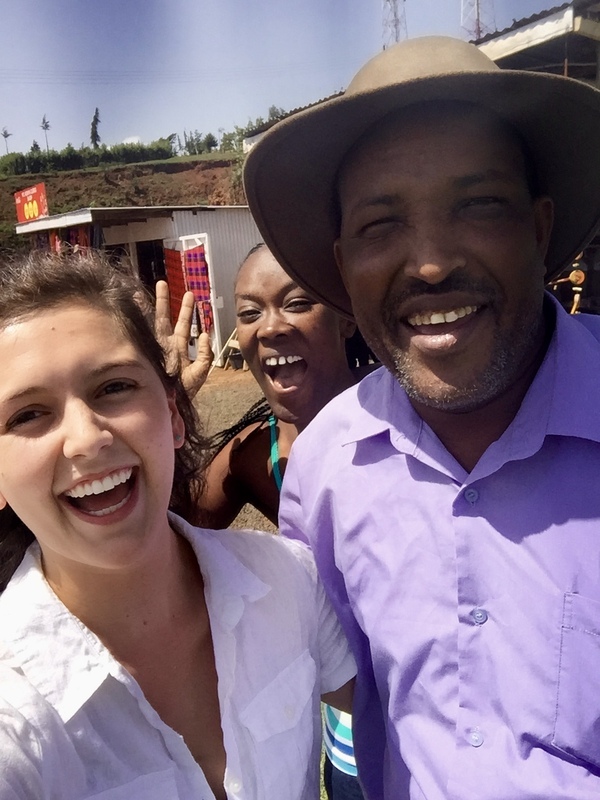 Monica has a heart of gold and drives CPI Kenya to achieve new feats. She and Hilary are a dynamic duo who could take the world by storm. She greeted me at the airport and she has made me feel so at home in Kenya since my first day. One of the highlights of my experience here was a weekend spent at her home in Kirinyaga County exploring tea plantations. Her generous and selfless spirit is unparalleled. Several years ago while in the field, she met a young boy who was nearly blind and in terrible health. She brought him back to Nairobi and has since raised him to be a thriving 9-year-old with a contagious smile and good marks in school. She is a Rotary Ambassadorial Scholar and she holds a Master’s Degree in Peace Studies from University of San Diego, California, United States. She has more than 8 years experience working with children. 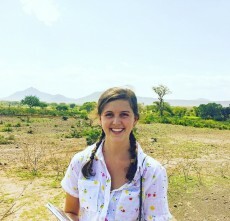 The idea of CPI Kenya was born when she and her twin sister, Jane, took a vacation to Marsabit. It was on this trip that they met Hilary, who saw them playing with children and envisioned a peace building program involving similar activities. Ever since, Monica has been working hard to build CPI Kenya with Hilary into a successful children peace building model. She has a natural talent and ease when it comes to teaching. 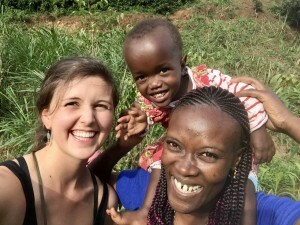 I love watching her engage with our beneficiaries and bring joy to CPI Kenya’s activities. Drinking camel’s milk with Jane in Baragoi. She has worked as a Peace Consultant among the pastoralist communities in Marsabit, Samburu, Baringo and West Pokot Counties in Kenya. She has also worked with young people acquitted for juvenile crime within the government of Kenya’s rehabilitation schools under CEFA, an international NGO, for 3 years. In three weeks, she departs for San Diego to pursue her Master’s Degree in Peace Studies. “I hope to gain new knowledge and skills that will help me improve the quality of CPI Kenya’s programs to be able to measure its impact over the years and assess the value it adds to beneficiaries.” Jane adds, “I will have a special focus on role of women in peace building to widen my understanding on the role I can play to contribute to peace in Kenya and in the world at large.” I am thrilled to have her return to the US with me and she is planning to come spend a snowy Christmas with my family in New Hampshire! Barbara is CPI Kenya’s new face of communications! Ambitious and goal-oriented. 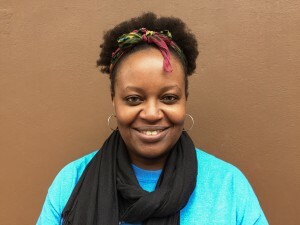 These are some words that can be used to describe Barbara.She has recently joined the team as an AP Associate and as CPI Kenya’s communications director. When I interviewed her, I knew she was a perfect fit for our team as soon as she said her overarching goal in life is to contribute positively towards society. She has just completed her degree in Social Communication with a major in print and web media from Tangaza University College. She has a diploma in administration and management from Strathmore University.She has over ten years of experience as an administrator and has previously worked in the banking industry, for a presidential campaign, and for various private consultancies in Kenya. She is starting a new chapter of her career in communications. Her focus is documenting NGOs’ impact because she feels that many organizations fail to convey their great impact on the ground. Barbara is interested in contributing to humanitarian work by lending her skills to increasing CPI Kenya’s visibility and outreach. 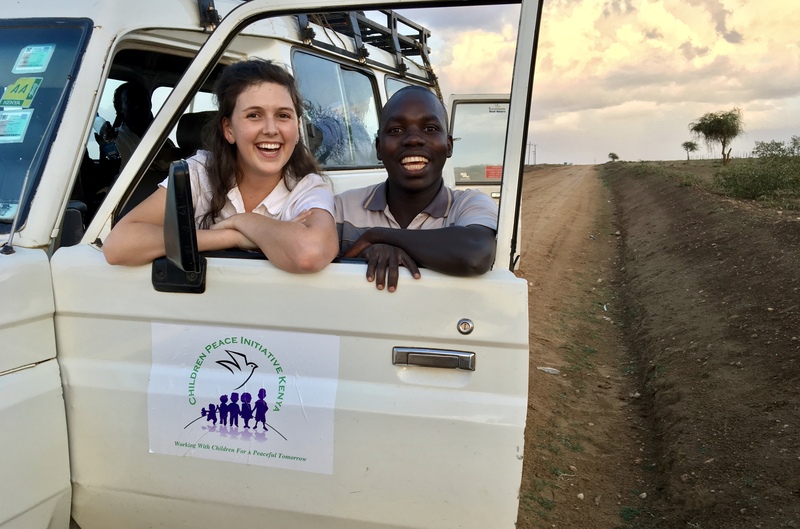 She has previously interned at Crown the Child Africa (CCA) and she is seeking to gain experience in communications for non-governmental organizations. Barbara dreams of pursuing a Master’s degree in Development Communication in the near future. CPI Kenya and AP are excited to welcome Barbara on board. Her determination, focus, and communications skills will be a great contribution in increasing CPI’s social media presence and visibility to donors. Michael and I couldn’t help but smile like fools on our first trip to the field. Michael served as a local intern alongside me over the summer. He joins CPI Kenya from Uganda, a second-year student pursuing a Bachelor of Arts in Sustainable Human Development in the Institute of Social Ministry in Mission (ISMM) at Tangaza University College affiliated to the Catholic University of Eastern Africa. 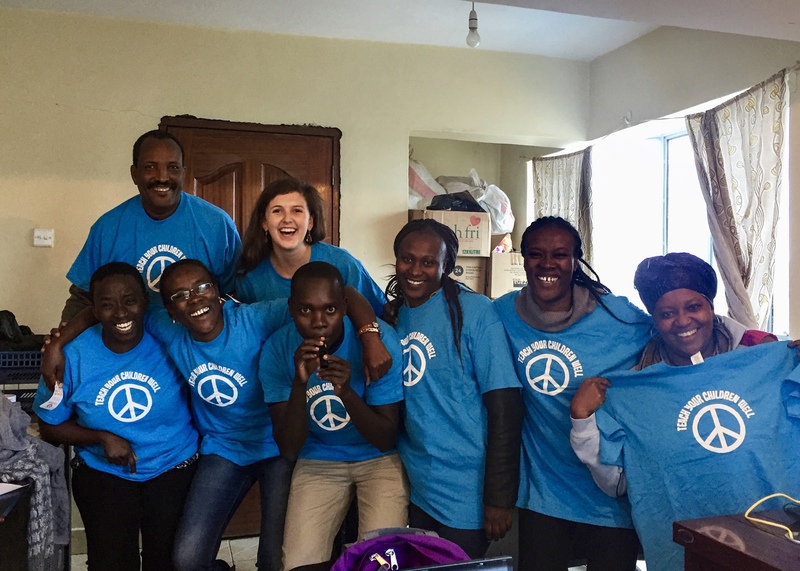 Michael is a Comboni brother with academic interests in justice, peace and conflict resolution—subjects he has learned much about through his summer internship with CPI Kenya. He currently serves as the chairperson of the Justice and Peace Commission (JPC) at Tangaza. Taken outside the office on my last day. Left to Right: Jane, Talley, Hilary, Barbara, Michael, Purity, Monica, Carol. Not pictured: our fearless driver, Francis.